The Amflo 12-100E blue polyurethane air hose has a 1/4" ID and is 100 ft. long. Its blue tube and cover are made of polyurethane, which has non-marring characteristics and provides resistance to weathering, abrasion, oil, and kinks. This hose provides both durability and flexibility at temperatures ranging from -30 to +150 degrees F. It is reinforced with a nylon braid for the strength necessary to reach and maintain its maximum pressure rating of 300 pounds per square inch (psi), and comes equipped with two 1/4" factory-installed, brass male National Pipe Thread Taper (NPT) swivel fittings with PVC (polyvinyl chloride) bend restrictors that reduce twisting and bending, increasing the life of the hose. 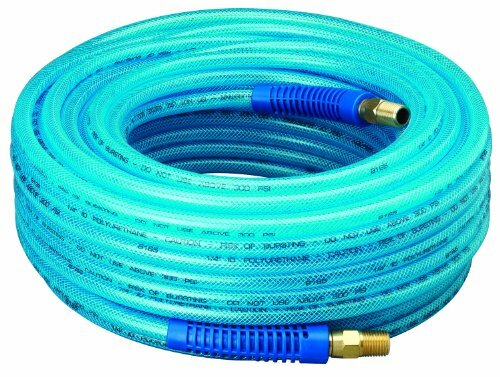 This hose is manufactured as a lighter-weight alternative to bulkier rubber and plastic hoses for use in contracting and industrial applications. 40% lighter than PVC hose. Features bend restrictors for added durability. Includes 1/4" NPT swivel fittings.